Where can I get the Dermatix Scar reduction gel as I will be doing Epi with Dr Chi ? And Sinecch is good? Can you advise me where to buy and how to take? I'm doing BUCCAL fats removal so maybe I need to take sinnech? Hi guys I just wanna share I went to tokai clinic last monday jan 23. Im on day 3 now and im happy with the results! I did chin aug, eyebag removal and otoplasty. Im suppose to do revision rhino but I had a bit of cough and phlegm that time so I cancelled it. So far I like my chin its like those chin of those korean popstars, maybe cuz when he asked me what chin do I like, he showed me various photos, and the chin I choose was the face of a korean looking girl. He really did do what I chose! The fat and line in my eyebags is gone its just swelling a bit, and my ears are quite pinned back I love it also. I guess what can i say if you go to dr pat you wont go wrong. Hes good and the price is quite affordable. Im quite thankful to this forum I discovered Tokai clinic. Thanks guys! Anyone gg hatyai during the 2nd week of March? Looking for ppl to share accomm. qiutinger wrote: Hello! I'd be going to Hatyai for alarplasty and maybe implant with Dr Nara. Does it sound okay??? I'm unsure if i need to go remove bandage on day three! And not sure if it's okay to keep taking plane (like twice) just one or two days after the surgery. Or should i just scrape BKK fun and shopping and head straight for Hatyai? And i just need to remember to buy Sinecch in Sg, and buy lotsa pineapple juice to drink after surgery right?! Anyone knows where i can buy Sinecch i super kiasu wanna buy it now!!! I think it will be better to head to hatyai straight. Take care of your nose is more imp! When are u gg by the way? Heading there first week of March!!! Now i'm worried that Dr Nara will change the op schedule so i think i'd only book the flight like 2 weeks before the date. Hope it'd be okay! Not sure if Hatyai has shopping at all O.O Google says nothing much lol. All the pictures look very rural and kampung. But i'm still hoping for the best! I will be there on the 6th. for me 7 days still very swollen, so i wear a glasses to block my eye for about a month. i think this is depend to your body..
i think this is depend to individual . prayer wrote: for me 7 days still very swollen, so i wear a glasses to block my eye for about a month. 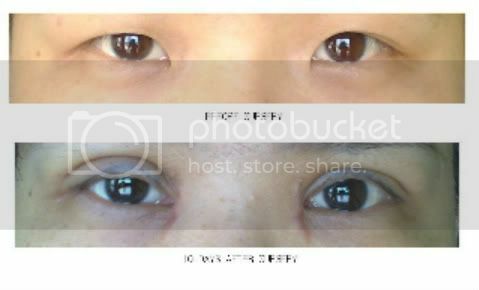 Actually before i went for the surgery, i already inform my colleague and my manager that i will do the double eyelid surgery..
the less like the stranger, i won't care lo..
My scar is also quite obvious and ppl asked me when they see the scar one is fading and one is abit raised. I didn't consume sinceeh. My lid is also still swelling.. I will post my picture soon . And also I wore my thick specs everyday as it can cover eyelid quite alot ..thick frame is good I applying concealer and foundation to cover a lil but left one is raised so can be seen.